Silver, gold, pearls and tourmalines. A cast figure of eight with applied shell ornament and a crest of pink and white baroque pearls, attached to a bar with a baluster terminal. 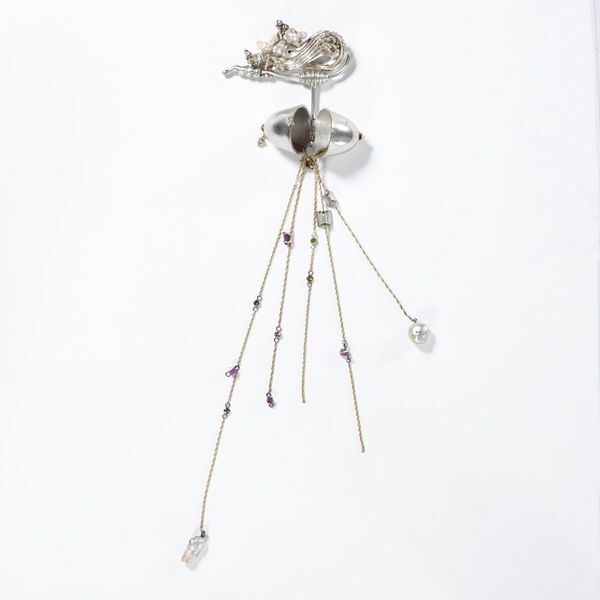 The bar supports a T-shaped rod which at its lower end forms the hinge-pin of two confronted cup-shaped devices with a spiralling shell catch.The bases of the cups are pierced and each threaded with three gold chains of irregular lengths, mounted with pearls and tourmalines. When the cups are open the chains fall from the front. When closed, short lengths of chain can be pulled through the bases, until stopped by a pearl or stone. The chain pendants can also be gathered up into the closed cups. Brooch with opening pod and jewelled chains, designed and made by Marilyn Davidson, USA 1977.